The Handy Squad have been patrolling Esher in their signature yellow scooters and vans for over a decade, enabling our expert plumbing team to reach anywhere within the area promptly. 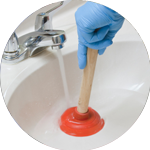 Since 2005, our team have successfully handled a wide range of pluming tasks to an exceptional standard, ensuring jobs are completed with both precision and care every time. 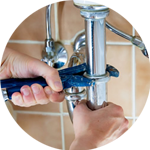 Drawing on their years of knowledge and expertise, you Plumber in Esher will be able to provide services related to; Replacements, Unblocking, Installations and Repairs. Esher is an outlying suburb of London. Alongside Esher Commons, the town marks one limit of the Greater London Built-Up Area. 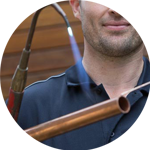 The Handy Squad have a multitude of trade services on offer besides plumbing. We also have a Handyman in Esher to provide assistance with generalised DIY tasks such as; Tiling and Flat Pack Assembly. For more specialised trade services, we have an Electrician in Esher. 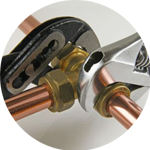 They will handle electrical tasks both safely and proficiently in both commercial and domesticated buildings. Your Electrician in Esher will be able to provide services related to; Fault Finding and Repairs, Lights, Replacements, Installations and Electrical Installation Condition Reports. To book your handyman, electrician, decorator, carpenter or plumber in Esher, fill out the online booking form.